Sebutape method is appealing for the actual sebum secretion measurement. The collection time could be shortened to one hour, and a digitized image of the Sebu-tape on its black backing should be captured immediately. 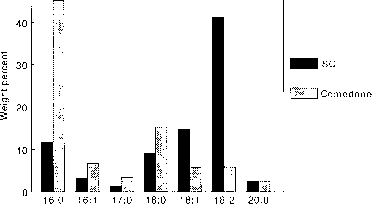 Subsequently, this image can be analyzed to estimate the sebum secretion rate from the total black area. In addition, information on the number, the pattern and the activity of individual glands can be obtained. The Sebutape can be removed from the backing and the lipids can be extracted and examined by thin-layer chromatography in conjunction with photodensitometry. In this way, one could obtain two measures of the sebum secretion rate, the overall lipid class composition and information on the pore density and variation in the activity of individual glands. At the time of birth, sebaceous glands are large and active, probably as a result of androgenic stimulation in utero (28). Shortly after birth, the sebaceous glands undergo atrophy and remain relatively small until the onset of puberty. The rate of sebum secretion in prepubertal children is generally low, but there is a measurable increase in sebum secretion beginning at about an age of seven (29). This is thought to reflect increasing secretion of dehydroepiandrosterone and its sulfated form from the adrenal glands. At the onset of puberty in males, the testes produce increased levels of testosterone. In the skin, this is metabolized to dihydro-testosterone, which binds to a cytoplasmic receptor protein. This complex translocates to the cell nucleus and modulates gene expression (30). In females, the ovaries do produce testosterone, androstenedione, and dehydroepiandrosterone; however, adrenal hormones are the major circulating androgens in women (31). In general, sebum secretion rates reach a maximum in the mid-teen years and slowly decline thereafter as circulating androgen levels decline. Hormonal control of sebaceous gland activity (Thiboutot) and the etiology of acne (Strauss) are discussed at length in later chapters of this book. As noted earlier, sebaceous glands are active in utero under the influence of maternal hormones, and sebaceous lipids are major components of the vernix caseosa (13). Vernix caseosa also contains exfoliated corneocytes. In the later stages of development, lung surfactant is produced and can be detected in the amniotic fluid. This surfactant at least partially dislodges vernix caseosa, and this material is ingested (32). Whether this has significance beyond possible provision of nutrients is unknown. The mean rate of sebaceous wax ester secretion in six-year old boys and girls was 5 mg/10 cm2/3 hr. This increased to about 25 mg/10 cm2/3 hr in seven-year olds and 50 mg/10 cm2/3 hr in eight-year olds (29). There is a major, age-dependent increase in the mean sebum secretion rate for both genders from ages 10 to 15 (33). After age 10, the mean sebum secretion rate at any given age was always greater for males. At age 15, the mean wax ester secretion rates were 0.75 mg/10 cm2/3 hr for boys and 0.55 mg/10 cm2/3 hr for girls (31,33). Sebum secretion rates appear to decline exponentially thereafter, reaching rates approximately half of secretion rates of 15-year olds at about age 50 (33). In individuals older than about 65 years, sebum secretion rates are in the same range as prepubertal children. FIGURE 1 Relative proportions of ester-linked fatty acids from acylceramide of comedones compared with acylceramide from the skin surface of normal control subjects. Abbreviation: SC, stratum corneum. Source: From Ref. 37. It has long been established that elevated rates of sebum secretion are associated with acne, and treatments that lower sebaceous gland activity are therapeutic (34). It should be noted that with the bentonite method for measurement of sebum secretion, the mean sebum secretion rates for nonacne control subjects, mild-to-moderate acne, and severe acne are significantly different with higher secretion rates, occurring with more severe disease (35). 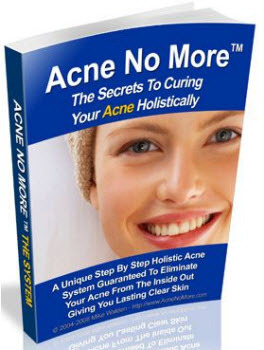 The role of sebum in come-dogenesis and initiation of acne and the available therapies are discussed in later chapters of this book. 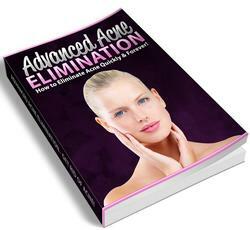 In general, any treatment that significantly reduces sebum secretion is therapeutic for acne. It has been demonstrated that sebaceous lipids can increase the permeability of the skin (36). This was first demonstrated after application of human sebum to neonatal rat skin in vivo. The follicles have not penetrated to the surface of the neonatal rodent skin, so there is no endogenous sebum. It was found that the application of human sebum to this skin surface resulted in a two-fold increase in permeability. In addition, in accord with the localized essential fatty acid hypothesis, it has been shown that in comedones, sebaceous fatty acids can replace linoleate in the acylcer-amide (37). This is illustrated in Figure 1. More recently, it has been reported that barrier function is impaired in acne patients compared to normal controls (38). Montagna W. The sebaceous gland in man. In: Montagna W, Ellis RA, Silver AS, eds. Advances in Biology of Skin. Oxford: Pergamon Press, 1963:19-31. Stewart ME, Downing DT, Pochi PE, et al. The fatty acids of human sebaceous gland phosphatidylcholine. Biochim Biophys Acta 1978; 529(3):380-386. Bloch K. The biological synthesis of cholesterol. Science 1965; 150(692):19-28. Downing DT, Strauss JS, Pochi PE. Variability in the chemical composition of human skin surface lipids. J Invest Dermatol 1969; 53(5):322-327. Weitkamp AW, Smiljanic AM, Rothman S. The free fatty acids of human hair fat. J Am Chem Soc 1947; 69(8):1936-1939. Marples RR, Kligman AM, Lantis LR, et al. The role of the aerobic microflora in the genesis of fatty acids in human surface lipids. J Invest Dermatol 1970; 55(3): 173-178. Gilbert D, Madison KC, Sando GN, et al. Acid lipase in lamellar granules. J Dent Res 2000; 79(special issue):322. Bergsson G, Arnfinnsson J, Steingrimsson O, et al. Killing of gram-positive cocci by fatty acids and monoglycerides. APMIS 2001; 109(10):670-678. Bortz JT, Wertz PW, Downing DT. On the origin of alkanes found in human skin surface lipids. J Invest Dermatol 1989; 93(6):723-727. Thiele JJ, Schroeter C, Hsieh SN, et al. The antioxidant network of the stratum corneum. Curr Probl Dermatol 2001; 29:26-42. Passi S, De Pita O, Puddu P, et al. Lipophilic antioxidants in human sebum and aging. Free Radic Res 2002; 36(4):471-477. Ponec M, Weerheim A, Lankhorst P, et al. New acylceramide in native and reconstructed epidermis. J Invest Dermatol 2003; 120(4):581-588. Nicolaides N, Fu HC, Ansari MNA, et al. The fatty acids of wax esters and sterol esters of vernix caseosa and from human skin surface. Lipids 1972; 7(8):506-517. .Green SC, Stewart ME, Downing DT. Variation in sebum fatty acid composition among adult humans. J Invest Dermatol 1984; 83(2):114-117. Stewart ME, Downing DT. Unusual cholesterol esters in the sebum of young children. J Invest Dermatol 1990; 95(5):603 -606. Downing DT, Pochi PE, Strauss JS. Synthesis and composition of surface lipids of human skin. J Invest Dermatol 1974; 62(3):228-244. Krakow R, Downing DT, Strauss JS, et al. Identification of a fatty acid in human skin surface lipids apparently associated with acne vulgaris. J Invest Dermatol 1973; 61(5):286-289. Downing DT, Stewart ME, Wertz PW, et al. Essential fatty acids and acne. J Am Acad Dermatol 1986; 14(2 Pt 1):221-225. Strauss JS, Pochi PE. The quantitative gravimetric determination of sebum production. J Invest Dermatol 1961; 36(4):293 -298. Downing DT. Photodensitometry in the thin-layer chromatographic analysis of neutral lipids. J Chromatogr 1968; 38(1):91-99. Downing DT, Stranieri AM, Strauss JS. The effect of accumulated lipids on measurement of sebum secretion in human skin. J Invest Dermatol 1982; 79(4):226- 228. Pierard GE. Follicle to follicle heterogeneity of sebum excretion. Dermatologica 1986; 173(2):61-65. Nordstrom KM, Schmus HG, McGinley KJ, et al. Measurement of sebum output using a lipid adsorbent tape. J Invest Dermatol 1986; 87(2):260-263. Kligman AM, Miller DL, McGinley K. Sebutape: a device for visualizing and measuring human sebaceous secretion. J Soc Cosmet Chem 1986; 37(4):369 -374. Pierard-Franchimont C, Pierard GE, Saint-Leger D, et al. Comparison of the kinetics of sebum secretion in young women with and without acne. Dermatologica 1991; 183(6):120-122. Clarys P, Barel A. Quantitative evaluation of skin surface lipids. Clin Dermatol 1995; 13(4):307-321. Schaefer H, Kuhn-Bussius H. A method for the quantitative determination of human sebum secretion. Arch Klin Exp Dermatol 1970; 238(4):429-435. Agache P, Blanc D, Barrand C, et al. Sebum levels during the first year of life. Br J Dermatol 1980; 103(6):643-649. Stewart ME, Downing DT. Measurement of sebum secretion rates in young children. J Invest Dermatol 1985; 84(1):59-61. Leyden JJ. New understandings of the pathogenesis of acne. J Am Acad Dermatol 1995; 32(5 Pt 3):S15-S25. Downing DT, Stewart ME, Strauss JS. Changes in sebum secretion and the sebaceous gland. Dermatol Clin 1986; 4(3):419-423. Narendran V, Wickett RR, Pickens WL, et al. Interaction between pulmonary surfactant and vernix: a potential mechanism for induction of amniotic fluid turbidity. Pediatr Res 2000; 48(1):120-124. Jacobsen E, Billings JK, Frantz RA, et al. Age-related changes in sebaceous wax ester secretion rates in men and women. J Invest Dermatol 1985; 85(5):483 -485. Strauss JS. Sebaceous gland, acne and related disorders—an epilogue. Dermatology 1998; 196(1):182-184. Harris HH, Downing DT, Stewart ME, et al. Sustainable rates of sebum secretion. J Am Acad Dermatol 1983; 8(2):200-203. Squier CA, Wertz PW, Williams DM, Cruchley AT. Permeability of oral mucosa and skin with age. In: Squier CA, Hill MH, eds. The Effect of Aging in Oral Mucosa and Skin. Boca Raton: CRC Press, 1994:91-98. Wertz PW, Miethke MC, Long SA, et al. The composition of ceramides from human stratum corneum and from comedones. J Invest Dermatol 1985; 84(5):410-412. Yamamoto A, Takenouchi K, Ito M. Impaired water barrier function in acne vulgaris. Arch Dermatol Res 1995; 287(2):214-218.